Most aquarists know they have to acclimate their new organisms. This involves slowly adding tank water to the transport water in an effort to gradually shift the organism's chemical and physical environment from the bag to the tank. What may not be obvious, however, is that photosynthetic organisms also need to be acclimated to a new lighting regime. This article seeks to show why it is important that corals' lighting environment changes be made gradually. The basic anatomy of a coral polyp shows the importance of food capture and digestion. A coral polyp's main body is called the gastrovascular cavity, and this is where digestion takes place. Corals also have tentacles with cnidae (e.g., nematocysts, spirocysts) to capture prey. Despite their ability to capture their own food, many corals have evolved a symbiotic relationship with a dinoflagellate alga, the zooxanthellae. This relationship works largely due to the usually low concentrations of dissolved nutrients in waters around coral reefs. The polyps share some of their waste with the zooxanthellae in exchange for the products of the algae's photosynthesis. This benefits both parties in a symbiotic relationship called mutualism. The zooxanthellae not only receive nutrients, such as ammonia, in an otherwise low-nutrient environment, but they are also protected from predation inside the coral's tissue. The polyp benefits from the carbon-rich compounds produced by photosynthesis. This provides the polyp with energy which is used to capture prey and also tide them over between feedings. While it was once believed only one species of algae was responsible for symbiosis in corals and other invertebrates, it has now been determined that there are more than 80 different strains of symbiotic dinoflagellates from at least four orders and seven genera (Borneman, 2001). Different strains have been found to have different photosynthetic capabilities, and corals may be able to switch from one species to another to acclimatize to specific conditions. Plants and algae can harness light energy by using a number of pigments. Chlorophyll a is the most widely used pigment for "harvesting" light and is found in zooxanthellae. Chlorophyll a has two light absorption pigments at around 440nm and 675nm. Wavelengths near these peaks are captured directly by chlorophyll a, but other light is either captured by some other pigments, such as chlorophyll c2 or peridinin, or the light energy is transferred by further pigments such as beta-carotene and diadinoxanthin, which results in a near 100% utilization of all wavelengths of visible light (Borneman, 2001). The rate of photosynthesis for any photosynthetic organism is related to the amount of light the organism receives. As photosynthesis produces oxygen, oxygen production is most often used to measure the rate of photosynthesis. In the dark, there is no photosynthesis, but as both the coral and the zooxanthellae are respiring, oxygen is used and so oxygen production is negative. As light intensity increases so does photosynthesis, and this relationship can be plotted on a graph, often called a P-I curve (photosynthesis-irradiance curve) (Falkowski et al., 1990). When plotted on the graph, it does not form a straight line (see Figure 1) with photosynthesis initially increasing rapidly with increasing light intensity, and then increasing far more slowly as intensity increases further. Photosynthesis reaches a point where it no longer increases as light increases. This is the maximum photosynthetic rate and is known as Pmax. 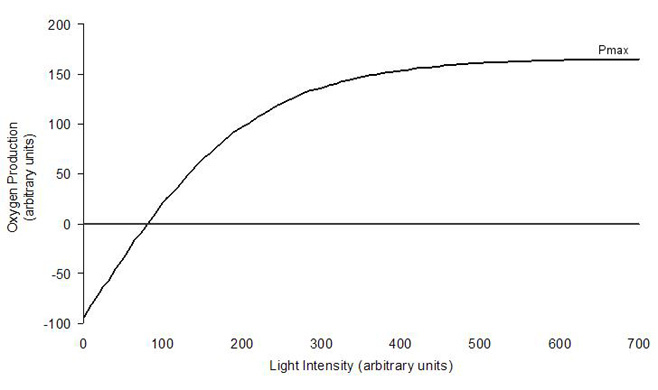 Figure 1: Idealized photosynthesis-irradiance (P-I) curve (after Falkowski et al,. 1990). A number of studies have found that increasing irradiance further beyond the level at which Pmax occurs can actually cause a decrease in the photosynthetic rate, and this is known as photoinhibition. In one study (Hoegh-Guldberg and Jones, 1999) it was found that photoinhibition can occur at quite low irradiance levels. Photoinhibition appears to be a natural process to prevent too much light from causing damage to the zooxanthellae and coral. Corals can control (or at least limit) the populations of zooxanthellae in their tissues by controlling the amount of waste they release to the algae. If the zooxanthellae population becomes too large, the corals can expel them. This is a normal process for corals, however, under some circumstances this process does not work well. Under conditions of high nutrients, the zooxanthellae can get nutrients directly from the water, and this can cause an increase in the zooxanthellae population somewhat beyond the coral's control (Marubini and Davies, 1996). Under conditions of stress, such as elevated temperature, the zooxanthellae appear to lose their ability to photoinhibit, and this affects the light reactions and leads to the production of harmful products such as oxygen free radicals (Hoegh-Guldberg, 1999). Under these conditions, the coral expels most, if not all, of the zooxanthellae, presumably to protect itself from damage. This is called bleaching, mainly because the loss of pigment (the zooxanthellae) causes the corals to appear white. While coral bleaching is usually associated with elevated temperature, other factors can cause it such as reduced salinity, increased or decreased light and toxins in the water (Hoegh-Guldberg, 1999). While stress has been shown to induce bleaching, shaded corals appear to be better able to survive the stress. Salih et al. (1998) found that the severity of damage to zooxanthellae of Pocillopora damicornis exposed to high temperature (32ºC) was dependent on the intensity of light to which the corals were exposed. The corals' polyps also produce pigments to protect themselves and their zooxanthellae from damaging ultraviolet radiation. Mycosporine-like amino acids (MAAs), which are largely clear have been shown to act as a sort of sun screen and protect the corals from UV radiation. Corals also produce fluorescent pigments. While the function of these pigments is not fully understood, there is evidence to suggest these pigments protect the coral and zooxanthellae from UV radiation and visible light. (Salih et al., 1998; Salih et al., 2000). Figure 1 shows the relationship between photosynthesis and irradiance. While the basic relationship is the same for all photosynthetic organisms, the actual values differ from organism to organism. Figure 2 shows the P-I curves for two corals from different depths. While the shapes of the curves are roughly the same, the coral from shallow water has a higher Pmax (30% higher than the deep water coral), and it reaches that at a much higher irradiance (more than four times higher). The differences in the P-I curves reflect the different photosynthetic efficiencies of the different corals. Figure 2: P-I curves for Acropora digitfera from a depth of 1m and A. divaricata from a depth of 40m (after Chalker et al., 1983). In addition to differences between organisms, the same organism will experience different average irradiance over time. For example, between summer and winter or if part of the colony becomes shaded by another coral growing above it. Under these changing conditions, the corals and their zooxanthellae adjust the efficiency of photosynthesis to ensure they receive sufficient energy. This is reflected in the change in the P-I relationship as it does between organisms. The ability that corals and their zooxanthellae have to alter the efficiency of photosynthesis is called photoadapation. The actual changes themselves are processes of photoacclimatization. These processes include simple things like expanding the polyps to expose the zooxanthellae, changes in the quantity of the photosynthetic pigments, such as chlorophyll a, within the zooxanthellae, changes in the density of the zooxanthellae within the coral and changes in the colony growth form (Falkowski et al., 1990). It is also likely that photoprotective pigments made by the coral are part of photoacclimatization providing more or less photoprotection as required. Note that while the terms acclimatization and acclimation are frequently used interchangeably, in physiology, the former is used to describe changes made by an organism due to natural environmental changes, and the latter is used for changes induced experimentally (Schmidt-Nielsen, 1975). Photoacclimatization, therefore, refers to changes due to natural lighting changes. The speed at which photoacclimatization occurs depends on the process. Expanding or closing polyps may take seconds. It takes hours to days for the zooxanthellae to adjust their photosynthetic pigments. It takes days to weeks for changes in zooxanthellae density to occur. Changes in growth form may take months or even years. As mentioned above, photoacclimatization refers to processes that result from natural changes in lighting, such as seasonal or shading. Photoacclimation is used to describe those same processes under artificial changes, such as lamp changes in an aquarium or moving between aquaria with different lighting. Under normal wild conditions changes are gradual and the difference in lighting that a single colony experiences is not all that great. Under aquarium conditions, however, the change in lighting can be quite drastic. In most cases we do not know at what depth a coral was collected and even if we did, the coral is likely to be subjected to low lighting from the time of its collection to the time it reaches our aquaria. If the coral has been kept under low lights, it will have acclimated to those conditions by increasing its photosynthetic abilities. If the coral is then placed under intense or very intense lighting, its rate of photosynthesis will be much higher than before. As new corals are likely to be stressed, the ability for the zooxanthellae to photoinhibit may be compromised. Without fully functional photoinhibition, this can cause the polyp to be supersaturated with free oxygen and oxygen radicals, which are toxic to the coral. The coral produces enzymes to destroy the oxygen but this, in turn, produces hydrogen peroxide, which is dangerous and must be removed. If the coral is fast enough, it will expel the zooxanthellae, and even then it may later die due to insufficient energy. If the coral does not perform this process quickly, it will most probably die. Additionally, the coral may be exposed to more UV radiation than it was previously, and this radiation may damage the coral's tissue. To avoid the above situation it is always best to slowly acclimate all new corals to the new aquarium's lighting conditions (this is also true when changing the lighting on a tank with existing corals). Light intensity should be reduced for a period of a few days to a week, and then gradually increased until the coral receives the full intensity intended for it. The amount of time taken should depend on the previous lighting conditions, if known, and the intensity of the tank's lighting. It is always safer to use longer acclimation periods rather than shorter. For new corals, I prefer to place them on the bottom of the tank and then place a piece of shadecloth between the light and the new coral. This means that only the new coral is affected by the lighting change. After a week I remove the shadecloth. Later, I move the coral to a place closer to the lights, and then eventually to its final position. Some corals may have come from lighting conditions similar to those in the tank, however, as the coral may be stressed, reducing the irradiance the coral receives is wise, at least until the coral has had a change to settle in. Exposing corals to lower light for these short times will have no detrimental effect. Reducing the photoperiod will only provide some benefit because the amount of time for damage to the corals to occur is quite short. Some hobbyists don't bother photoacclimating their new corals and don't have any problems. It is far safer, however, to do some photoacclimation, especially if the corals are stressed. Hopefully, I have shown the benefits of photoacclimation of corals and that by gradually increasing the amount of light new corals receive, aquarists will have few losses of new corals. Borneman, E H (2001). 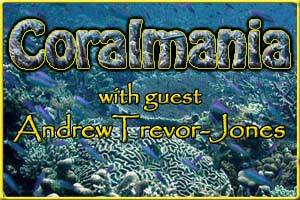 Aquarium Corals: Selection, Husbandry, and Natural History. Microcosm Ltd., Charlotte, VT 464pp. Chalker B.E., Dunlap W.C. and Oliver J.K. 1983. Bathymetric adaptations of reef building corals at Davies Reef, Great Barrier Reef, Australia. II. Light saturation curves for photosynthesis and respiration. J Exp Mar Biol Ecol 73:37-87. Falkowski P.G., Jokiel P.L. and Kinzie R.A. 1990. Irradiance and corals. In: Dubinsky Z. (ed.) Ecosystems of the world. 25. Coral Reefs. Elsevier, Amsterdam, pp. 89-108. Hoegh-Guldberg O. 1999. Climate change, coral bleaching and the future of the world's coral reefs. Mar. Freshwater Res. 50:839-866. Hoegh-Guldberg O. and Jones R. 1999. Photoinhibition and photoprotection in symbiotic dinoflagellates from reef-building corals. Mar. Ecol. Prog. Ser. 183:73-86. Hoegh-Guldberg O. and Smith G.J. 1989. The effect of sudden changes in temperature, light and salinity on the population density and export of zooxanthellae from the reef corals Stylophora pistillata Esper and Seriatopora hystrix Dana. J. Exp. Mar. Biol. Ecol. 129:279-303. Marubini F. and Davies P.S. 1996. Nitrate increases zooxanthellae population density and reduces skeletogenesis in corals. Mar. Biol. 127:319- 328. Salih A, Hoegh-Guldberg O and Cox G (1998). Photoprotection of Symbiotic Dinoflagellates by Fluorescent Pigments in Reef Corals. In: Proceedings of the Australian Coral Reef Society 75th Anniversary Conference, Heron Island October 1997 (Greenwood, J.G. & Hall, N.J., eds 1998). pp 217-230 School of Marine Science, The University of Queensland, Brisbane. Salih A., Larkum A., Cox G., Kuhl M. and Hoegh-Guldberh O. 2000. Fluorescent pigments in corals are photoprotective. Nature 408:850-853. Schmidt-Nielsen K. 1975. Animal Physiology: Adaptation and Environment. Cambridge University Press, London, 699pp.